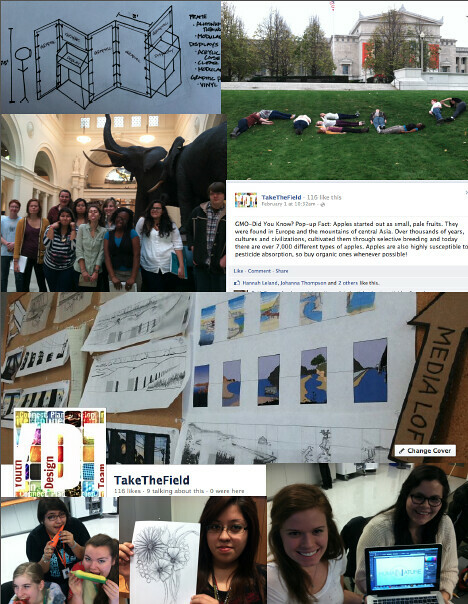 As the deadline for finishing the pop-up exhibit approaches, the Youth Design Team has been furiously working. The pieces are starting to come together, and everyone is starting to get a clearer idea of how the pop-up will look and feel when it is finished. I am part of the Content team, which has finished the rough drafts of the material that will be in the pop-up and is working on polishing and editing them.We are also helping the Video Production team with script concepts and content and the Social Media/Outreach team with posts to Facebook. The Social Media/Outreach team, in addition to working on posts to Facebook, is working on designing a website for the pop-up. The website is going to feature extra content that won’t be in the pop-up: fun stuff like a game and possibly a video! The Design team has solidified their ideas for color palette and logo and is working on panel layout. They will be working with the Content team on content length and how the wording will fit into the panel. We’ve noticed that people tend to be daunted by wordy panels, so we have to seriously decrease the amount of words that we’ve written for our panels. This may prove to be one of the most difficult tasks that we’ve been dealt — I never realized how difficult it would be to say more in less! The Video Production team has been working on scripts for three separate movies and will be shooting them sometime in the near future. These movies will be both at the pop-up and on the website that Social Outreach is working on. One of the movies that we’re looking forward to seeing is one that compares the life of an urban raccoon to the life of a raccoon in the forest. It sounds like it will be really great! The Interactives team has been working on flipbooks that will be on the pop-up anda game based on post-apocalyptic survival. This game is designed to put players in a post-apocalyptic world overrun with zombies. The game offers the player several choices to make in order to survive the apocalypse. The right choices will mean survival, but make the wrong choice and you will end up as zombie chow! The Production team has been working hard on making blueprints for the setup of the pop-up as well as how the pop-up will be laid out once it is set up. As a member of the Youth Design Team, I think I speak for all of us when I say we are all so excited that everything is coming together so nicely. It’s really amazing to see because when we first started this project, it was hard to imagine the finished product, but as we work we really can tell that everything is just falling into place.